Going well clan. 2 of our members, Youngoldfella and Whitewebbs have already reached the magic 20 scavenges - well done. Lets keep scavenging - all scavenges count whether high or low scoring. Well done to all 14 other Minotaur members for keeping our clan competitive. I was going to say "keeping us in first place", but I've just seen we've been bumped back to third place. I hope the competition stays this close for the remainder of the game! At the moment there are 16 of us in the game. Some of us are into it more than others as we have the time. I am setting personal goals for each fortnight as I can as I am recently retired but that is me. I for one have maxed out for this fortnight so I will have to wait for week 3 and 4. The lead is going to change many times over the next 7 weeks but I am in the game for the fun and enjoyment and for reaching personal set goals. We work as a team and achieve what we can for the team. All the other clan's members for the other 3 clans will be doing the same. Go out have fun and enjoy yourselves no matter what team you are in as after all we are GCA geocachers for Dragon Zone even though competitive natures will avail. Good luck to everyone and every team and as stated Enjoy the experience even though this is a competitive environment for the next 7 weeks. Merry Christmas and a very happy and good Geocaching 2017 tpp everyone and your families. I murdered the Locationless today and tomorrow it is time to hide regular sized containers. We've got five containers almost ready to go, including a 20 litre bucket. Just waiting to see if a 'hide a large cache' scavenge crops up. Well done oldfella and J_&_J you are both working hard. We hope to duck out in the next few days and find a few high scoring caches. 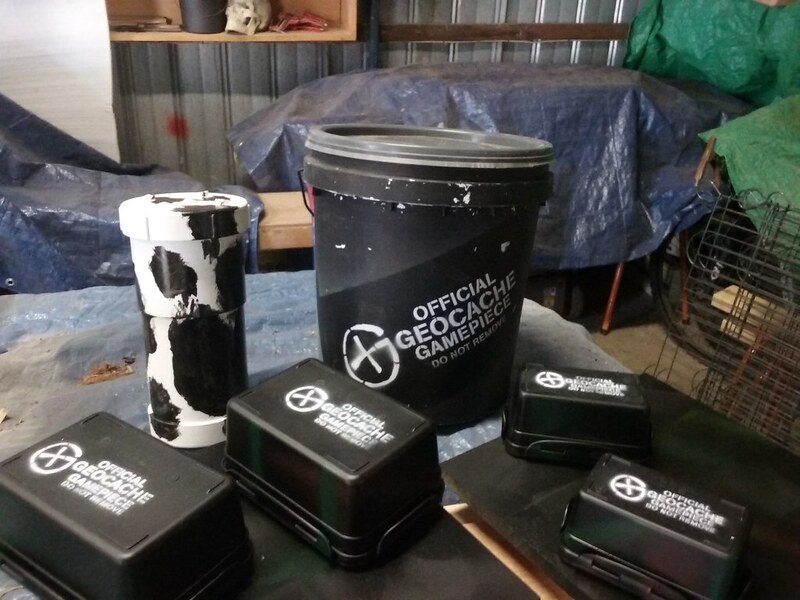 Will put out some as soon as we can get time to make/& camo some bigger containers. Have fun everyone. BTW....My find on a certain cache today attracted the attention of the local police. Luckily I wasn't questioned, but the cache owner was! Minotaur seems to be spending a short spell in last place of the Scavenger competition! Time to start hiding some caches to build our average points score up! I also have a Sistema lettuce container painted up and ready to hide, as well as four bison tubes to use in the 'Hide a Micro' challenge and the 'Hide a Multi' challenge. Hides that are hidden as multi's or puzzle caches can bring in good points for the clan, and the puzzles don't have to be difficult to solve to still get the points. Let's see if we can rally together and get Minotaur back in to winning contention. We have a few more to put out. All large puzzles so should accumulate a few useful points. I published, as Geocaching Australia, two CORS today - one in Victoria, the other in QLD & both as close to Clan Minotaur members as is possible. Used Tag of CORS. Sorry, had a 1982 moment. Published one in Ulverstone - TP7509. Tag is CORS. Thanks for the Ulverstone CORS Tuena. We had a look for it. It is there but very hard to see and Botanical Resources are a bit touchy about trespassers. We have a photo. We will also look up the other Tasmanian CORS. Hobart Minotaurs might like to look for the Brighton, Hobart or Glenorchy Cors. Check the website Tuena has provided on the Ulverstone Cors page then click on google maps and enlarge to get the Tasmanian ones. There are 14 all up. Last edited by 2y'stassies on 23 December 16 7:56 pm, edited 1 time in total. Do CORS exist in South Australia? Where do I find out? When we drove to Sydney in March we came across one at Balranald, but as it appeared to be just a brick building, we didn't log anything. Since then we've learned a little more about them, but not whether there are any near us.